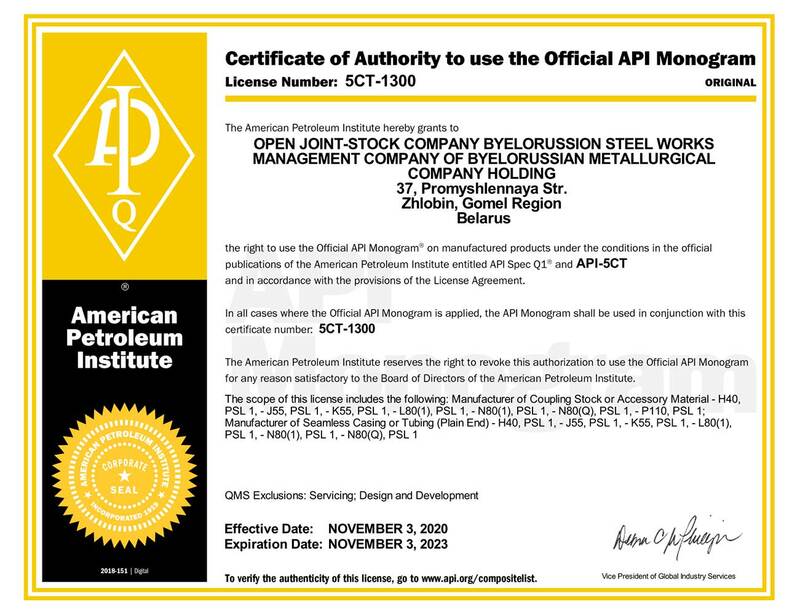 Certificate of Authority № 5CT-1300 (American Petroleum Institute) to use the Original API Monogram – manufacture of coupling stock Group1, H40/PSL 1, J55/PSL 1, K55/PSL 1, N80(1)/PSL 1 and N80(Q)/PSL 1, Group-2, L80(1)/PSL 1, Group-3, P110/PSL 1; manufacture of seamless casing or tube plain end Group-1, H40/PSL 1, J55/PSL 1, K55/PSL 1, N80(1)/PSL 1 and N80(Q)/PSL 1 , Group-2, L80(1)/PSL1 (the scope is expanded). Certificate of Authority № 5L-0634 to use the API Monogram Spec 5L – manufacture of Line Pipe Plain End at PSL 1 – Type of Pipe: SMLS/Delivery Condition N/Max. Grade: X65and/ Delivery Condition R/Max/ Grade X65; manufacture of Line Pipe Plain End at PSL 2 – Service Annex J – Type of Pipe: SMLS/ Delivery Condition: N / Max. Grade: X52 and/ Delivery Condition: Q/ Max. Grade: X65.